goes out to all those who help make the Jubilee a success. From businesses to individuals, who contribute their goods, time and talents - it would not be possible without your dedication. Take Route 281 South 9 miles to New Centerville. Sponsored by and for the benefit of New Centerville and Rural Volunteer Fire Co. 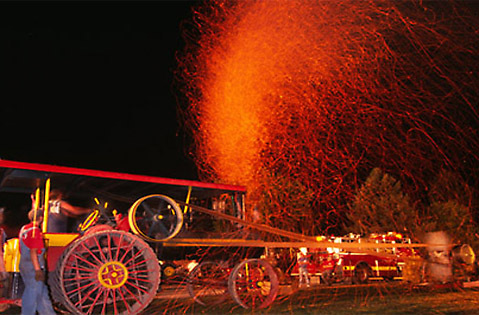 The Jubilee is part of the "4 Fall Festivals" of the Laurel Highlands. Breakfast - served daily 7 am to 9 am at the ouside firemen's concession stand. Noon Meals - served Thursday and Friday only, beginning at 11:30 am to 1 pm. Menu changes daily. All meals served at the Banquet Hall. Hamburgers, hotdogs, fries, baked potatoes, soft drinks, pie, cake, apple dumplings, soft freeze, pizza and much more available continuously in the Museum Hall and at the Track Stand. Chicken Barbeque - Saturday & Sunday 11 am to ? 8 am - 5 pm - Registration of Quilts (Upstairs of Banquet Hall) For info call Rose Younkin 814-926-3129. 3 - 6 pm - Registration of Photos for the Jubilee Photo Contest (Museum Hall). For info call Megan Critchfield 814-233-5653. 3 - 6 pm - Registration of Scarecrow Contest and Pumpkin Decorating Contest (Museum Hall - Photo Contest Area). For info call 814-926-3142. 10 am - 5 pm - Registration of Apple Pies for Grandma Hazel's Apple Pie Contest at the Pie Stand (Museum Hall). For info call Robin Zambanini 814-926-4800. 6:15 pm - Grand Jubilee Parade (Track Area). Chair: Chad Burket 814-289-3719 (cell). For info call Jack Illar 814-442-2288. For info call Dean Brant 814-443-4134. 4500-7500 (Track Area). For info call Dean Brant 814-443-4134. 9:30 am - Pedal Power Tractor Pull. Prize drawing for Pedal Power Tractor Pull following event (MUST BE PRESENT to win). 2:30 pm - Hay Bale Toss. Prize drawing for Hay Bale Toss following event (MUST BE PRESENT to win). 10 am - 3 and 4 Wheelers Pull (Track Area). 10:30 am - Arm Wrestling Tournament (Museum Hall). Contact Bill Raszewski 814-445-8577 (Arm Wrestling Rules). 2 pm - Horse Pulling Contest (Track Area). Pulling Contest (Track Area) For info call Orlo Weller 814-442-3262. Only service animals permitted on grounds. All proceeds benefit the New Centerville and Rural Volunteer fire Co.
Tractor Pulling (rules and regs) - Dean Brant - 814-443-4134.